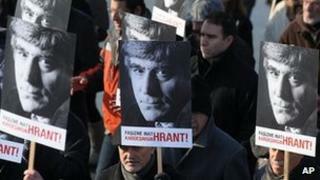 A court in Turkey has jailed three people for involvement in the 2007 killing of prominent Turkish-Armenian journalist Hrant Dink. The judge sentenced Yasin Hayal to life for incitement and two other men were given 12 years in prison. Mr Dink, shot dead outside his Istanbul office, angered Turkish nationalists by describing the mass killing of Armenians a century ago as genocide. His teenage killer, Ogun Samast, was jailed for 22 years last year. After the verdict, a crowd of about 500 people including members of Mr Dink's family marched to the spot where he was shot dead to protest at what they said was state collusion. The court in Istanbul also acquitted 19 people, including Yasin Hayal and the two other men convicted of involvement in the killing, of being members of a criminal organisation. Mr Dink's supporters say they have uncovered evidence that suggests involvement by state officials and police in his murder. But, they say, repeated requests to have those officials investigated have been ignored, and in some cases important evidence has been destroyed. The European Court of Human Rights ruled in 2010 that Turkey had failed to protect Mr Dink, despite being warned that ultra-nationalists were plotting to kill him. The court has also criticised Turkish authorities over the investigation of his murder. Hrant Dink, who was the editor of Agos, a bilingual Turkish-Armenian newspaper, had previously been prosecuted and convicted of denigrating "Turkishness". The BBC's Jonathan Head in Turkey says there is anger among Mr Dink's supporters that no-one else has been convicted over his killing. The government has promised sweeping reforms of the entire justice system, but after more than nine years in office it has yet to fulfil that promise, he adds. The Turkish state strenuously denies that the deaths of hundreds of thousands of Christian Armenians in 1915-16 amounted to genocide.